How we look has probably never held quite so much value in society as it does now. It has never affected an individual's sense of self worth quite like it does in this day and age. 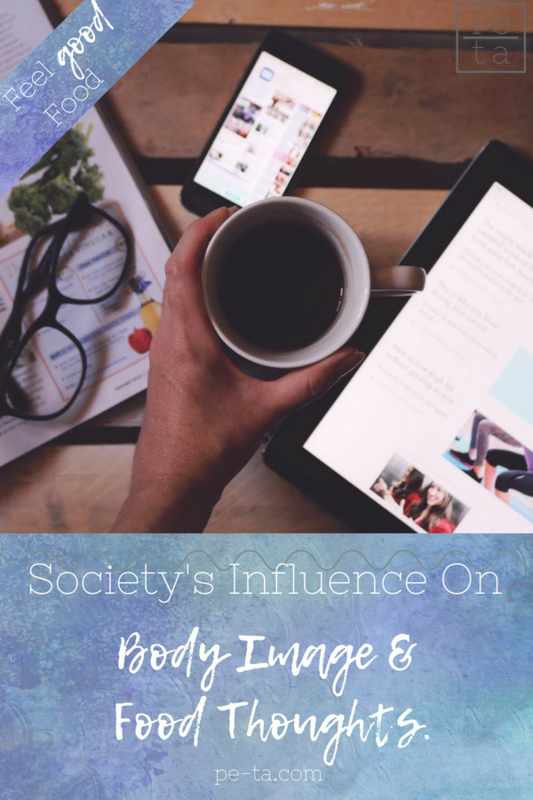 Today we’re chatting about society’s influence on the thoughts we have around food and body image. It’s a huge subject and one I am only touching the very tip of the iceberg on today. I highly recommend delving further into this by reading articles and studies online, understanding how we are influenced can go a long way into understanding our behaviours, beliefs and thought patterns surround food and body image. The media projects an idealistic image of the human body. For women it’s often glowing clear skin, tiny waists, toned arms and legs, big eyes and perfect hair. For men it’s six packs, huge shoulders, a perfectly chiseled jaw and towering height. None of us can actually achieve this because 99.9% of the imagery has been digitally modified. Our brains are constantly being shown images of what a “human” looks like only for us to look in the mirror and not match up. Our minds are being bombarded with what we should look like, we’re not consciously thinking the images we’re receiving have been modified, we’re just noticing the differences. The average adult in the western world sees between 3000 and 5000 advertisements a day. Numbers vary depending on the study you look at, some claiming that it is up to 20,000 advertisements a day. Have a think about the different places you see adverts: tv, radio, on the side of a bus, billboards, online on facebook, instagram, twitter, your favourite blog, newspapers, magazines - the list is endless. How often are you shown a digitally modified version of a person in those adverts? Anne Becker an expert on Eating disorders at Harvard Medical School in Boston decided to look into this. She chose to study females in Fiji. Why? Because up until the mid 1990s there was only one reported case of anorexia nervosa in the whole country. In 1995 the Government of Fiji allowed Western TV Shows to be broadcast on the television stations in fiji and even then remote parts of the country were only just starting to hear about TV. In 1998 Becker held a small survey which was later reported in the British Journal of Psychiatry in 2002. Just 3 years after Western media arrived in the country, one in every ten girls reported having vomited to lose weight. By 2007 Becker’s team had spent over a decade studying the impact of the media on females in Fiji. More than 500 girls ages 15 to 20 were surveyed, the results showed that at least four in every ten reported vomiting to manage their weight. This report also showed that the girls didn’t have to directly consume the media, they were being influenced by those in their social circle - family and friends, who had consumed western media. Up until 1995 Fijian culture valued large, strong women, it had a very positive message around women eating a lot. This study alone shows just how much the media can affect us. But it’s not just teenagers and adults that are affected. Our behaviours around food and body image can often be traced right back to our childhood. Have a think about the toys you played with as a young child. Barbies with perfect bodies, Polly Pockets with their cute little outfits and pretty hairstyles. Action Men with six packs...ever seen a Barbie or an action man with even the hint of soft, gentle, huggable skin on their tummy? I don’t think so. Even Pregnant Barbie was absolutely tiny with a magnetic perfect bump. According to a study held in 2002 by Cash and Pruzinsky, 90% of girls aged 3 to 11 own a Barbie doll. The Yale Center For Eating and Weight Disorders looked into how a young adult woman could achieve Barbie’s proportions - it was medically and physically impossible. According to the National Association of Anorexia Nervosa and Associated Disorders 81% of ten year olds are worried about getting fat. This isn’t solely down to the media though, it’s the subconscious messages children are receiving from those around them. How are the adults in their world acting around food? How do they speak about their bodies? What are their reactions to body image? Whether we like it or not, all of this impacts a child’s perception of the world. The media can often send us mixed signals though, food is shown as a comfort during hard times, a celebration during happy times and something to luxuriously enjoy whenever we crave it - I’m not saying this is wrong in any way whatsoever. However, the mixed signals come from people who seem to be enjoying these foods all of the time all the while looking like the “ideal” version of humans we have created. We need to stop idealising the human body. We need to stop showing food as a fixer of all things in adverts, tv programs and films. How often have you seen a crying female in a film reach for a tub of ice-cream or a glass or wine? Whilst there’s absolutely nothing wrong in doing this, we have to start realising that the ice-cream or wine can’t solve our problems, once we’ve finished distracting ourselves with it, we will have to face whatever drove us to emotionally consume it in the first place. Does the number on your scales reflect the person you are inside? Does it show your kindness? Your intelligence? Your loyalty? Your love? Your passions? Your interests? Your strength? If you’re a shoe size 6, would you choose to push yourself into a shoe size 4? Would you aspire to one day be a shoe size 4? If you could take yourself back to your childhood, what age would you have been when you first became aware of your own body image?